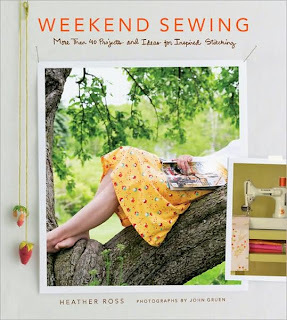 After hearing fantastic things about Heather Ross' new sewing book, Weekend Sewing, I just could not resist. I've always stayed away from garment sewing and thought this may give me an opportunity to change that. I've stocked up on elastic thread, which is used quite a bit in the book, and am ready to tackle some projects for summer (if it ever gets here). First up is the smocked sundress for little girls -- I've got the fabric picked and the pieces cut. The projects in the book range from accessories to apparel and also use various weights of fabric. One of the other great things is that all of the patterns are included at full size (they do need to be traced) and are very versatile. Heather Ross has a set of pattern modifications on her blog that are definitely worth viewing. After the smocked sundress, next up is the summer blouse with a few minor changes. I often fall "victim" to purchasing the new craft books when they hit the shelves, but this one was certainly worth the investment. Not only are the projects versatile but the photographs are also beautiful to look at. This is definitely at the top of my summer reading list. I always think cutting is the hardest part, you're in the home stretch on that one!